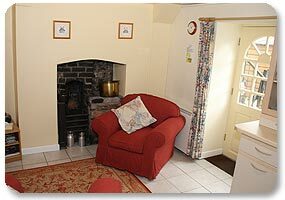 Situated in the grounds of Bron Heulog and set in a tranquil village with beautiful countryside surroundings, Garden Cottage is a completely renovated charming Victorian cottage, available for self catering. Ground floor - Modern kitchen. Electric cooker, refrigerator and microwave, cutlery, crockery and a good range of cooking equipment. Sitting area with two easy chairs. Stairs lead to first floor. 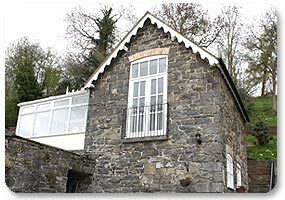 Double bedroom with French doors overlooking the village and the Berwyn Mountains in the distance. Full size bathroom - WC, wash hand basin, bath / shower. 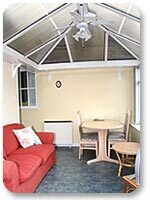 Furnished conservatory with a spectacular view over the village and upper Tanat valley. Patio doors lead to patio seating overlooking the owners' Victorian walled garden. Bed linen and duvet provided. Electricity included. Heating by storage radiators. Please bring your own towels. Open most of the year, Colour TV/DVD player, Parking. We regret that we can not accept any pets in the cottage. "With all star qualidies being provided, the final grade dictated by this particular element would be 4 star. However, lack of a washing machine precludes the 4 star grade, and subsequently the 3 star grade is retained."